Yacht Rock luminary Kenny Loggins is adapting his 1984 No. 1 hit song “Footloose” into a children’s book. But since the new book is based off of the song, and not the film, it will have a dearth of evil John Lithgow, and won’t help you in your next game of Six Degrees Of Kevin Bacon. Instead, it showcases a gang of animal pals kicking off their Sunday shoes for a dance party. “The meter of the lyric is a little tricky, “ explains Loggins, dropping some music theory on the kids. 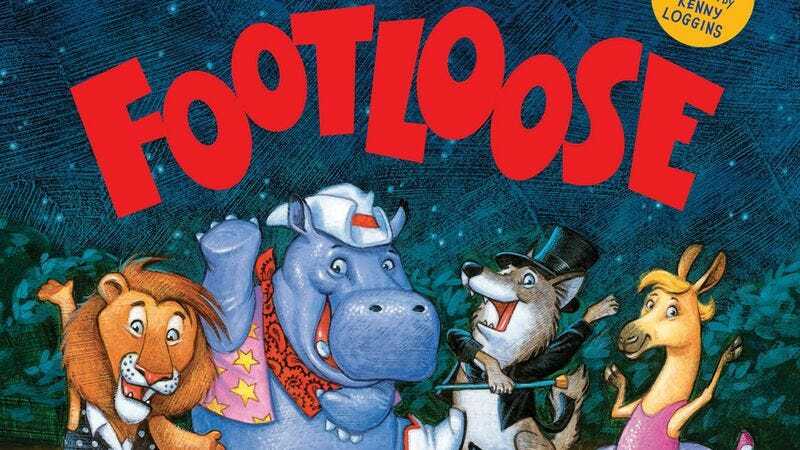 “But if you’re familiar with the song [“Footloose”], and most people are, you quickly get how the words are bouncing off of the pages.” The story features such characters as a “rockin’ chimp” named Louise (“Geez, Louise”) and a lemur that goes by Marie. You get the rest. “My first seven years were spent in Seattle,” explains Loggins to children’s literature trade magazine Story Monsters Ink. “Lots of rainy days. Lots of opportunities to read.” The first book Loggins remembers reading was House At Pooh Corner; the singer-songwriter even adapted the story to song, first recorded by Nitty Gritty Dirt Band in 1970 and then by Loggins and songwriting partner Jim Messina on their 1971 album Sittin’ In. “Simplicity is the watchword in stories and music,” explains Loggins of writing for kids. “When a song becomes a book, the lyrical images come alive. With Footloose, the key was to have lots of animals doing funny things. Once I got the picture in my head of this zoo coming alive under the full moon, the lyrics just poured out.” The book—featuring illustrations by acclaimed children’s artist Tim Bowers—comes packaged with a CD featuring new recordings from Loggins. Unfortunately, the CD will not feature a Steve Lukather guitar solo or backup vocals from Michael McDonald, so the new tunes will probably not be as yacht-y as some fans would like. Footloose is now available at Amazon.